W5WSS describes his antenna at (eHam 2014). It is essentially a shortened dipole with capacity hats for 20m. The configuration appears from several postings to be this shortened dipole with a Balun Designs 1115du balun at the center and an adjacent LDG Pro 200 automatic ATU. 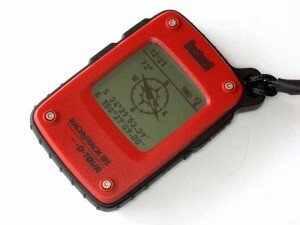 I purchased a Bushnell Back Track D-TOUR, partly because it appeared to have a useful digital compass. The digital compass turned out to be a major disappointment . The documented calibration procedure made little difference, it was still commonly more than 10° in error (not due to nearby magnetic objects, or T/M variation).